Today I get to share with y'all something I've been working on a lot behind the scenes -- something that makes me feel proud, and humbled, and grateful. 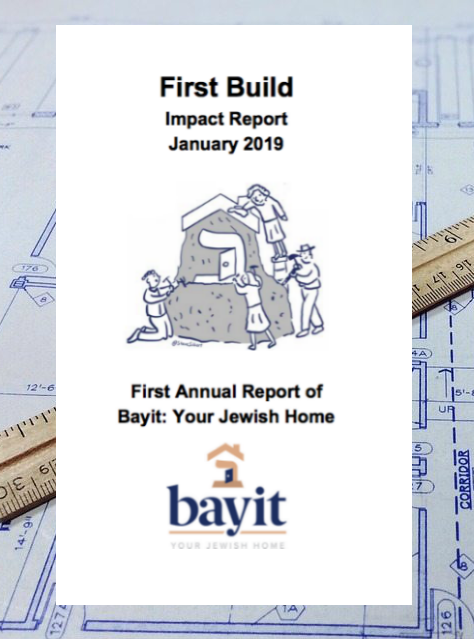 First Build reflects many hours of work -- and more importantly, it reflects an enormous amount of heart and soul and commitment on the part of the friends and colleagues with whom I've been blessed to midwife Bayit into being. You'll find information about our fellow-travelers, our advisors and teachers, our organizational partners. Here you'll find also our foundational documents, bylaws and ethics materials, as well as a list of our donors and supporters, because we believe in transparency and accountability above all. I am humbled and overjoyed to be a part of Bayit. I am incredibly proud of what we've built so far -- and also of how we've built so far, with integrity and care and compassion, with rotating leadership to ensure that everyone has an opportunity to serve, with openness to outside opinions and new perspectives, with an eye always on whether what we're building is in service of our animating principle that everyone can be a builder of the Jewish future and that that future belongs to everyone. I hope you'll read it, and be inspired, and let us know how you want to take up your tools and build with us. Download it now from our Annual Reports page: First Build: Impact Report January 2018.